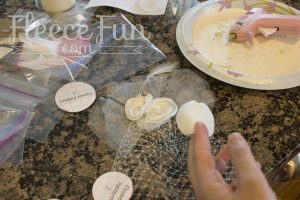 You can learn how to make fascinator with this free pattern and tutorial. This fun fast facinator is great for pictures and weddings. This is a good “basic formula” or jumping off point for a dramatic hair piece. 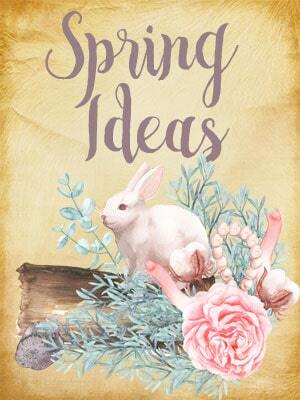 This combination would also look good mounted on a mini top hat or mini pirate hat. 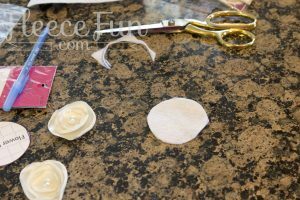 We’ll be using a pattern from another tutorial of mine – the no sew satin hair clip. Using the flower pattern sizes 1- 3 I made three small flowers. 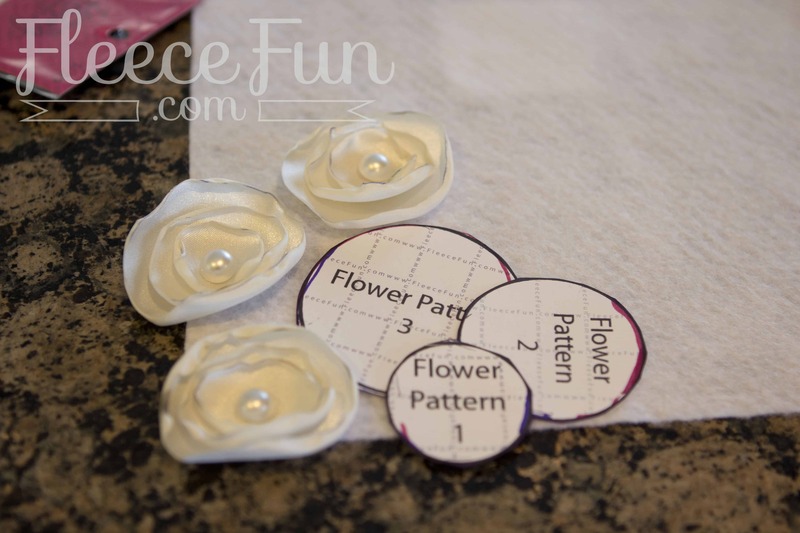 I cut out 9 circles total and made three flowers. 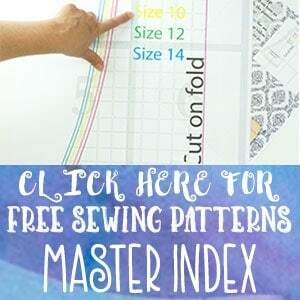 You can get the pattern and see the video tutorial on this page. Once you’re made the three small flowers set those aside and we’ll begin to build the facsinator. 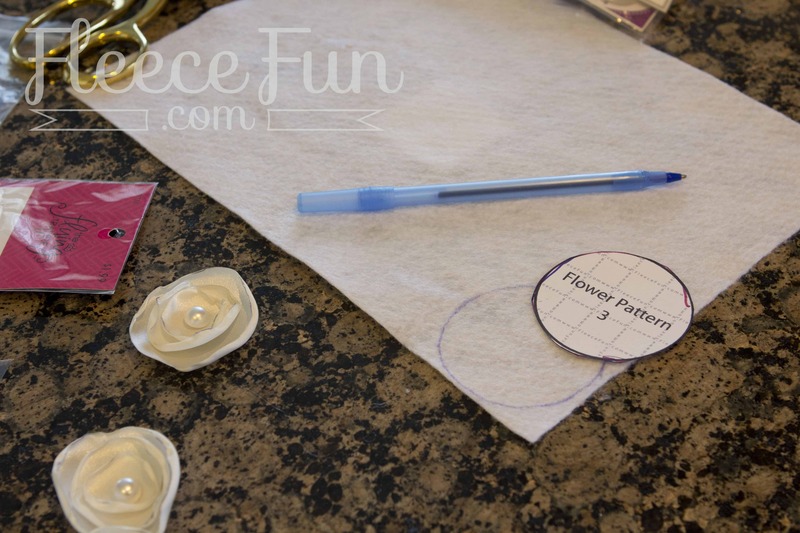 Taking pattern circle 3 trace onto felt and cut out. This will serve as the base onto which we will glue everything. Cut out three tulle circle roughly six inches in diameter ( it doesn’t need to be a perfect circle). 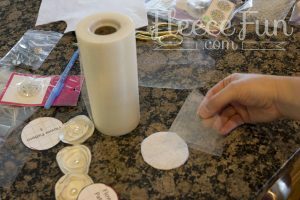 Then take one tulle circle and fol in half, then fold in half again. It should look like a quarter of a circle. 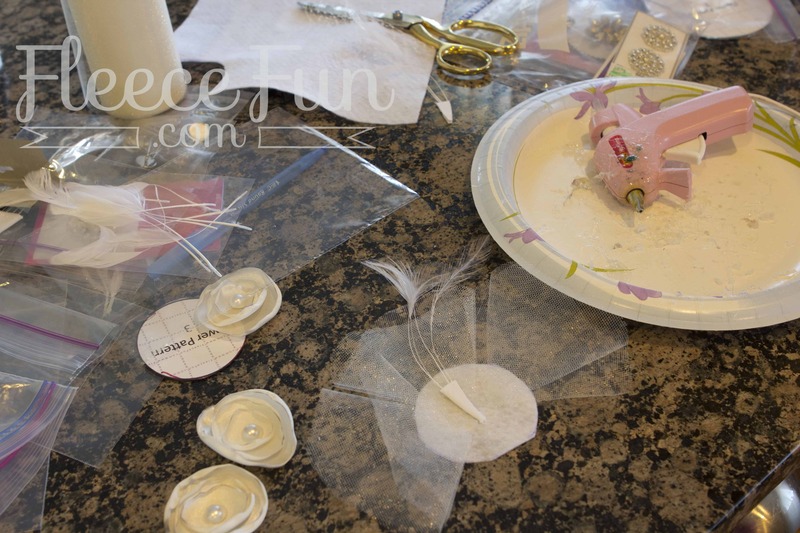 Then take your glue gun and squirt a large bead of glue onto the paper plate ( do not use Styrofoam for this). 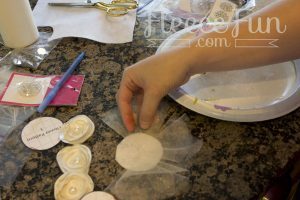 Dip the pointed end of the tulle circle into the hot glue bead and then place onto the felt base. 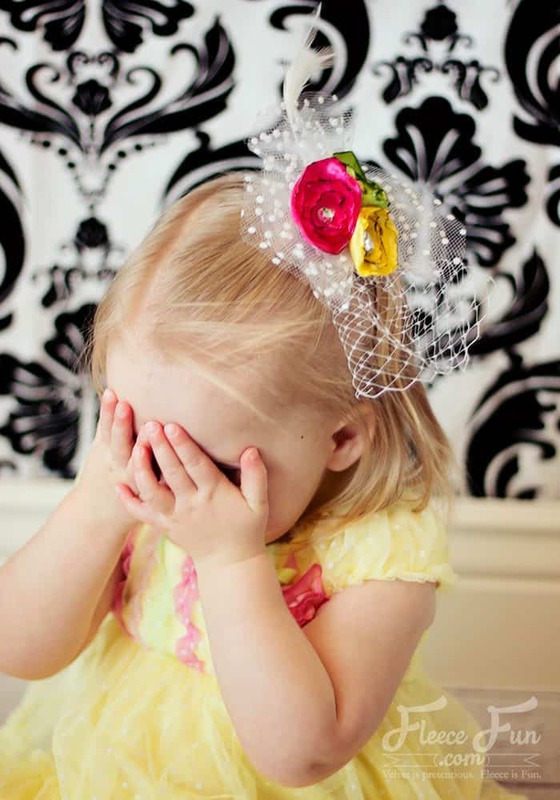 Repeat 2 more times with the remaining tulle circles. You can see the placement I used in the picture. Place the feathers where you would like them. 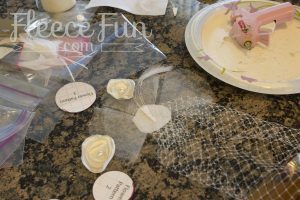 Then scrunch the lace and place where you would like it – but don’t glue it yet (its impossible to glue without using the method in the next step. 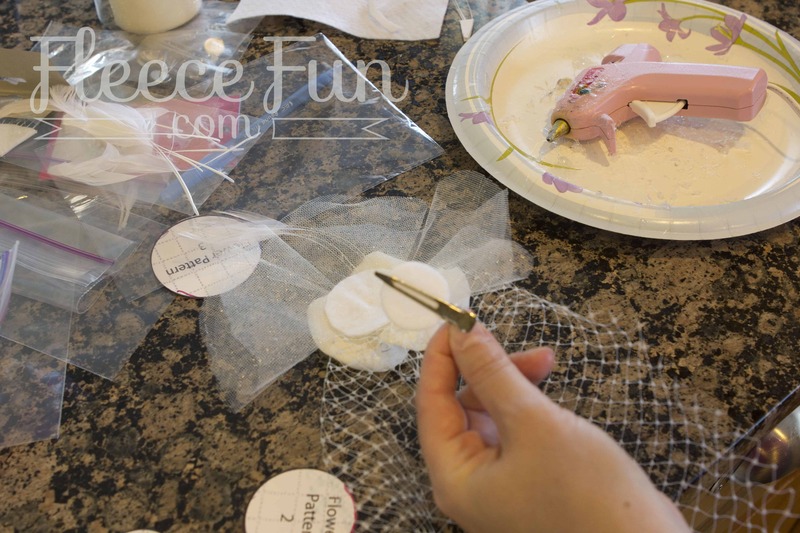 Placing a bead of glue on the back of the satin flowers, place them on top of the base and the millenary lace, gluing the flower and the lace down. glue down all the flowers in a desired arrangement. If necessary trim down the back (or felt base) so it won’t show through the tulle. Cut out a small circle of felt (I used pre-packaged small circles) and place it in between the prongs of the clip. glue the circle and the clip to the back side of the fascinator. You’re finished!